Ah, it’s been a while, hasn’t it? I’ve just come back from a skiing holiday in Austria and I am still trying to recover from a silly amount of muscle pain and a salty food and beer overdose. All in all, a successful holiday. Photos (mainly of food and snow) will follow. I took my netbook with me hoping to write a couple of posts and keep up with a bit of work, but in my search for wifi all I found was giggles from the locals. I managed to locate a computer with The Internet on it, in a hotel basement, but I couldn’t bring myself to stay down there for long when the sun was shining and the pistes were waiting! Anyway, enough with the Austria talk, since it (probably) belongs to a different post. I though I’d tell you about a little adventure I had before I left. It was after a long day of work so I came back completely exhausted and brain-dead. Alex wasn’t around which can only mean one thing: pasta for dinner! It was going to be an easy, straightforward meal, until I read this post. I had tried once before to make my own pasta and decided to dive into the most difficult recipe I could find: Soft egg ravioli. Well, the egg wasn’t too tricky, but the pasta was so difficult to roll out that I spent literally hours trying to make half a dozen of them. I decided I would not try it again without a pasta machine. But Dawn claimed that it was pretty straightforward even by hand, and I decided to give it a go. Well, she was right! It was actually so good and so easy that I made it again the next day. Here is the recipe, although I haven’t done anything different than she did. Sift the flour into a large bowl or a clean surface. In another bowl, beat the eggs, olive oil and salt until smooth. Mix with the flour until it has all been incorporated. Knead until smooth. It didn’t take me more than 10 minutes of kneading until the dough looked smooth and elastic. Wrap in cling film and let rest for half an hour. I took advantage of that time to make the sauce. 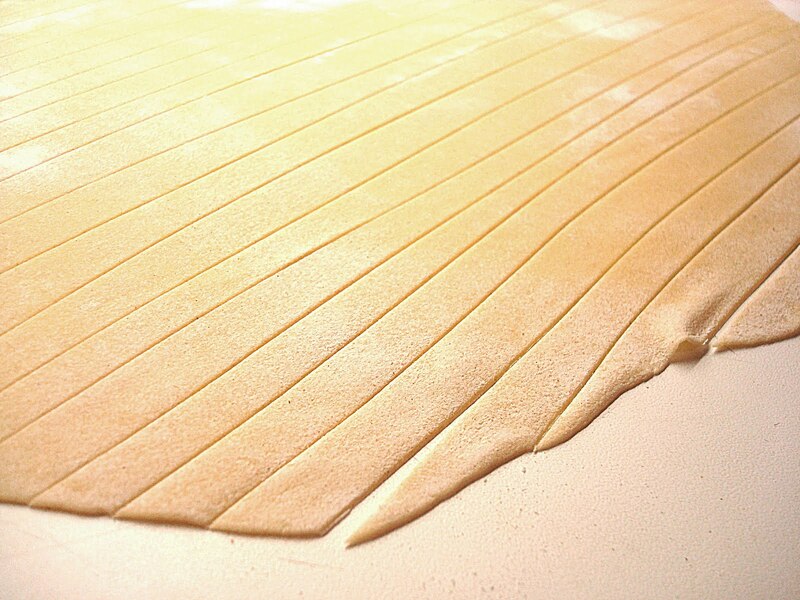 Cut in 4 equal pieces and roll each one out onto a thin sheet. 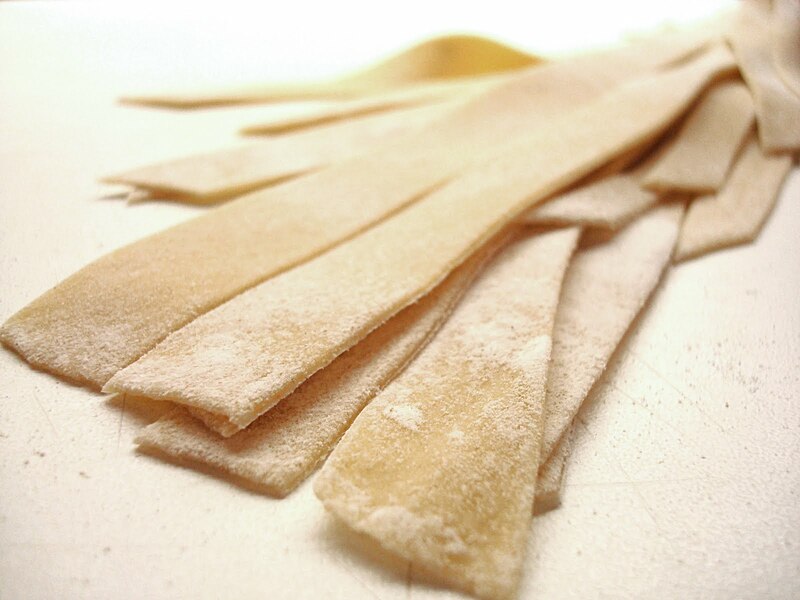 The pasta will get thicker when cooked so make sure you make it thin enough. 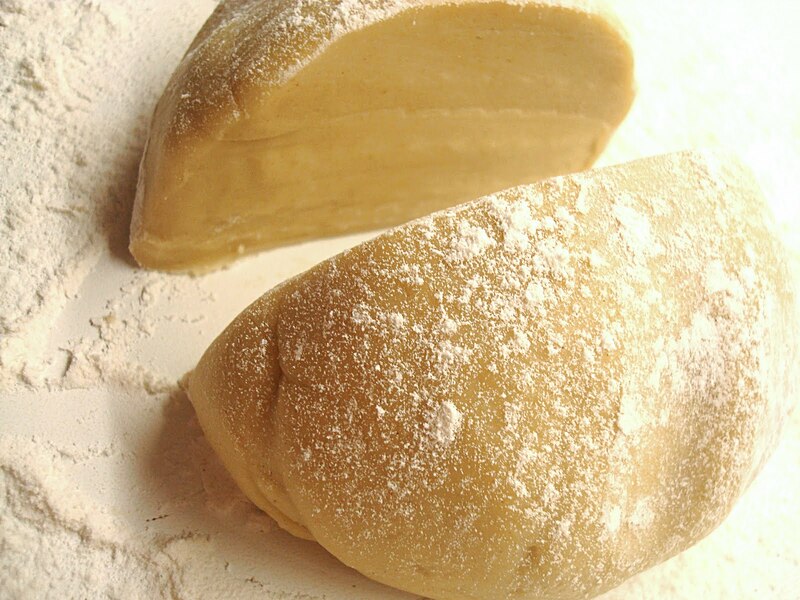 Dust your surface and rolling pin with flour so the dough doesn’t stick. It only takes 5 minutes to roll out and the dough is very nicely behaved. I cut it into strips using a pizza cutter but you can use a knife or cut them into circles/squares and fill them with whatever you fancy. Cook in salted water for about 4 minutes, although it depends on how thick they are. Serve with your favourite sauce. The taste and texture is so much better than dried pasta (although I’m still a huge fan of course!) 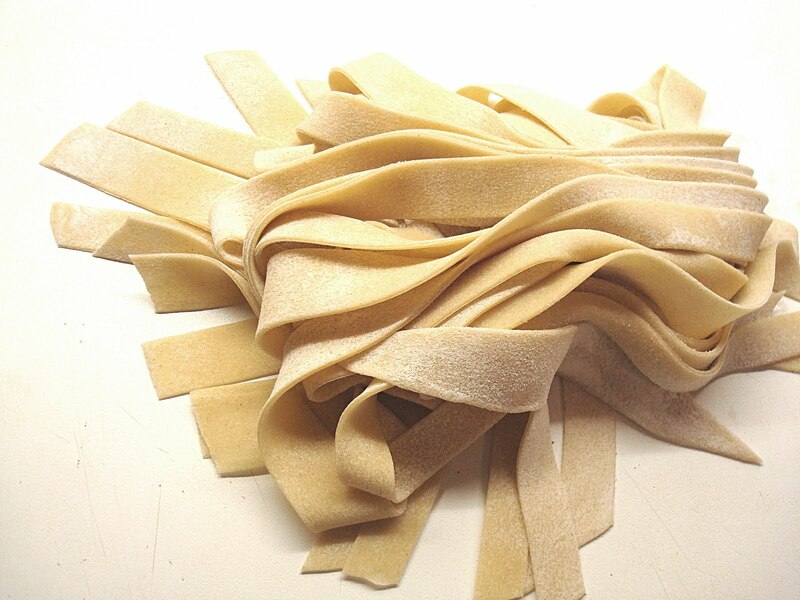 or even store-bought fresh egg pasta. You can easily make a very simple tomato sauce while the dough is resting and you have yourself a really tasty and surprisingly quick meal! I had mine with a roast tomato and aubergine sauce and loads of grated cheese on the top. For two days in a row. I suppose the point of this post is to urge all of you pasta lovers to go ahead and make your own pasta if you haven’t done it before. Do not be intimidated if you haven’t got fancy equipment. Kneading and rolling is pretty therapeutic and the result will be worth it! You make it look very easy! I'll definitely give it a try. The pasta looks fantastic! Thank you for the in-between pictures also… I am going to give this a try! 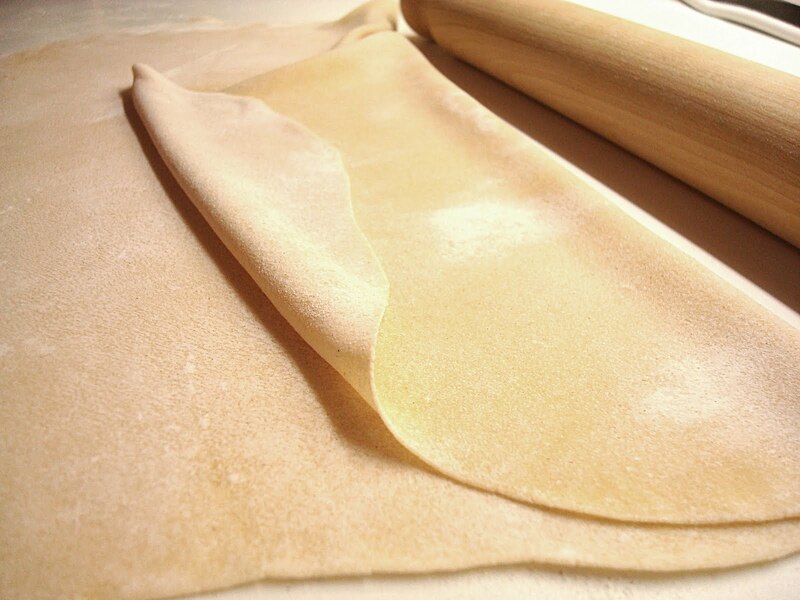 I love making homemade pasta, but at times I hate dragging out the rolling machine. You've inspired me to roll, and cut my own tonight. Mmmm… now which sauce should I make? @Kath and @Nancy I'd love to see the results if you do try it! @Angela Really, even the simplest sauce makes this into a fantastic meal. I love roast tomatoes and peppers blended into a smooth sauce. 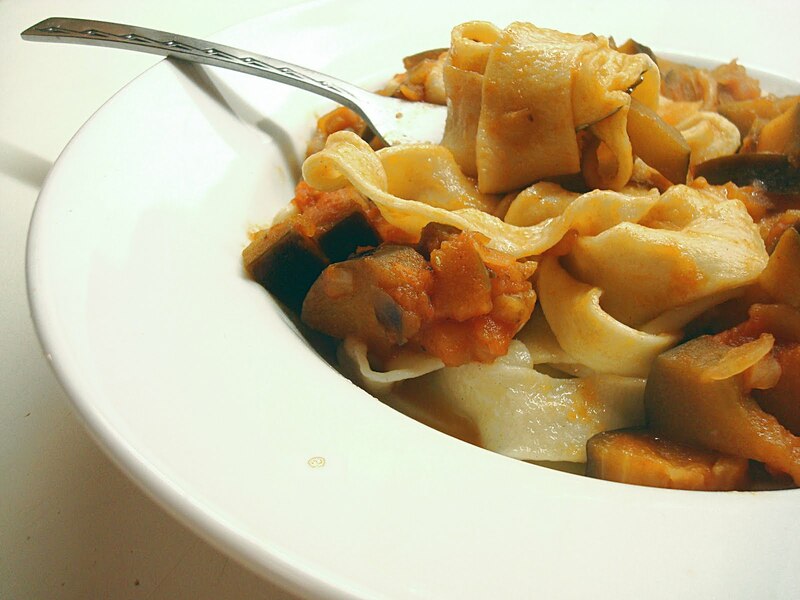 And then you can add aubergines, courgettes, mushrooms. Or go for a rich meat ragu. I'm sure you'll enjoy the process and the results whatever you choose! I just tried making this pasta with my kids and unfortunately, it was waaay too dry. I tried adding some more oil, but it was still too dry. I'm on my way now to the grocery store to buy more eggs……according to the directions, you sift the flour after measuring…..am I wrong? Hello Anon, I'm sorry it didn't work for you! Yes, you do sift the flour after you measure it. I would normally add the flour slowly to make sure there isn't too much. The measurements of course depend on the flour you're using and the size of the eggs so they are all approximate. It shouldn't need anymore oil. Silly question, but did you keep on kneading even when it was looking dry? It takes a few minutes for the flour to be incorporated and at first it looks like a big floury mess, and pretty dry too. Hope it worked out alright in the end, please let me know! It is a good advice. Serve with your favourite sauce. Because most people like tomato sauce but that doesn´t mean you have to serve it that way if you are not fond of that sauce. Feel free to do whatever you want, you are the cook, right? I learnt about all of this when I travelled to Argentina. I did so many BUENOS AIRES TOURS that I can say I know Argentineans better than the back of my hand, and they love pasta, so I know how to cook it too.